Command Sergeant Major Scott C. Schroeder graduated in 1979 from King George High School, King George, Virginia. He enlisted in the United States Army in May of 1983. He received his Basic and Advanced Individual Training as an electronics mechanic at Fort Bliss, Texas. After his first enlistment he reclassified as an Infantryman. During his 34 years of service, Command Sergeant Major Schroeder has held numerous leadership positions to include: Fire Team Leader, Squad Leader, Platoon Sergeant, Operations Sergeant, First Sergeant, and Command Sergeant Major. He was a Command Sergeant Major for 14 years and has served as the Command Sergeant Major for the following Commands: U.S. Army Forces Command CSM; Command Sergeant Major of III Corps & Fort Hood; Division Command Sergeant Major of the 101st Airborne Division and Fort Campbell; Command Sergeant Major of the 2d Brigade Combat Team 101st and was the Battalion Command Sergeant Major of 3d Battalion, 502d Infantry, and 1st Squadron, 75th Cavalry. Command Sergeant Major Schroeder's other assignments include: 2d Battalion, 5th Infantry, Schofield Barracks, Hawaii; 1st Battalion, 50th Infantry, Fort Benning, as a Drill Sergeant; 3d Battalion, 75th Infantry, Fort Benning; 2d Battalion 505th PIR, Fort Bragg; and 5th Group USAAD, Federal Republic of Germany. Command Sergeant Major Schroeder has deployed to Sinai Egypt and participated in Operation Desert Shield/Desert Storm in 1991 while assigned with the 82d Airborne Division. He has also deployed to Afghanistan in 2001 OEF I with the 101st Airborne Division (Air Assault) as a First Sergeant. He deployed to Operation Iraqi Freedom I and 05-07 as a Battalion Command Sergeant Major with the 101st Airborne Division (Air Assault). He served as the 2d Brigade Combat Team, 101st Airborne Division (Air Assault) Command Sergeant Major during Operation Iraqi Freedom 07-09. 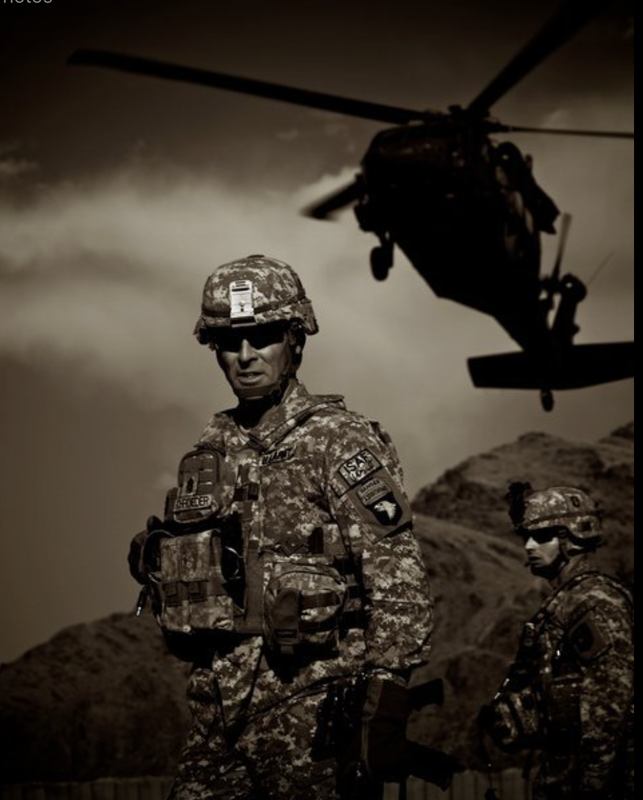 As the Division Command Sergeant Major for the 101st Airborne Division (Air Assault), he deployed as the Command Sergeant Major for Combined Joint Task Force 101 in Regional Command-East Afghanistan for OEF X-XI. He deployed as the ISAF International Joint Command and III Corps Senior Enlisted Leader, Kabul, Afghanistan (2013-2014). Since retiring Scott has worked with a nonprofit focused on Veteran and First Responder rehabilitation and suicide prevention. He currently lives in Charlotte N.C. and is working to build his own business focused on training, and coaching. Command Sergeant Major Schroeder is married and has three children (Jason, Dillon, and Shelby). A book about practical NCO leadership and the importance of presence—no doctrine, no philosophy, no war stories. Behind the Colors is based on the premise that NCOs should master specific skills at each level of Leadership. It includes practical stories of success and failure to highlight the importance of mastering these skills, which will carry an NCO through their career. Behind the Colors is a Leadership Book for Soldiers of all ranks: Past, Present and Future. Appropriate for all ages and applicable in life as well as service to the Nation as a Noncommissioned Officer in the Army. Download the Appendix to Behind The Colors HERE.